For those who are waiting for the infamous waterproof case for new Samsung, it will come soon this April. With the special Ultrasonic Fingerprint Scanner on the new Samsung phones, LifeProof also ensure that you will still be able to use that while underwater, how cool is that? So when you get hands on the LifeProof FRE, there's special installation that you need to follow in order for fingerprint scanner to work. A. 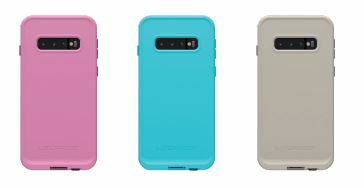 Remove any case or screen cover, including Samsung's pre-installed screen cover. B. Program your fingerprint following manufacturer's instructions. C. Clean screen with alcohol wipe, dry with microfiber cloth. A. Pull tab to remove Adapter, exposing adhesive back (do not touch adhesive). B. Activate display and adhere Adapter to screen over the illuminated fingerprint. C. Press out air bubbles, hold for 30 seconds and peel away release liner slowly. A. Using included instruction, first water test then install case. B. If adapter gets dirty and stops working, clean with alcohol wipe and air dry. C. For best results, leave case on for 24 hours.